My family originally hails from Goa. Its a beautiful small coastal state on the west of India. Its breathtaking beaches and eclectic mix of ancient Hindu temples and Portuguese inspired churches have made it the most popular destination in India. The abundant seafood available dominates the cuisine making it a preferred choice for the residents and tourist alike. Our daily meal at home too usually comprises of rice, fish curry and fish fry. It may sound monotonous but there are numerous variations of cooking the same fish so we don't ever get tired of it. 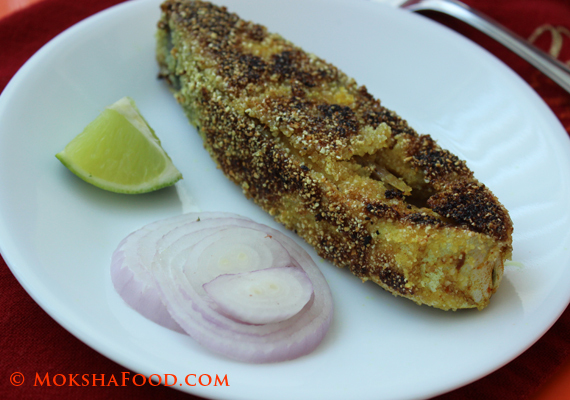 This pan fried fish recipe is very simple, quick and also healthy as pan frying reduces the amount of oil consumed. No marinating required. Wash the fish steak well and pat dry. Season with salt and keep aside. Meanwhile prepare tamarind paste or use store bought. I make mine fresh by soaking dried tamarind in hot water for sometime and later squeezing out the pulp. Traditionally idli rava is prepared at home by washing the rice grains and drying them in the sun. Later they are ground to coarse texture to be used for coating the fish. I found that the idli rava available at Indian grocery stores works well. 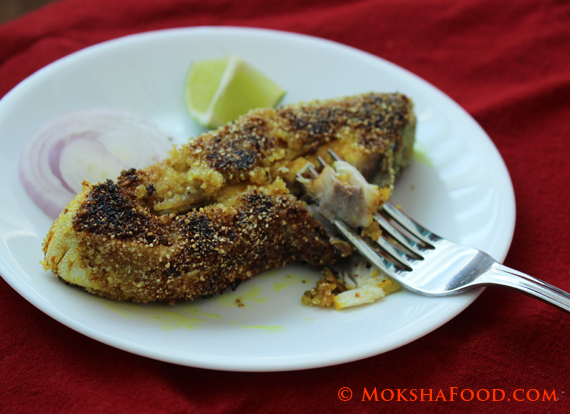 If you can tolerate gluten, then you can also use rava or suji to coat the fish and make a crust. Now add the turmeric pdr and chili pdr to the fish. Pour in the tamarind paste and coat the fish nicely. When ready to fry, heat the oil in a small pan to medium heat. In a plate spread out the idli rava. Coat the fish uniformly on all sides with the idli rava. Place on the hot oil and cook. Flip the fish after about 5 mins and the crust would have been formed and browned nicely. Cook the other side too. If the steak is cut thick, increase cooking time. Also hold the fish vertically with tongs and crisp up the sides of the fish too. Serve the fish hot with lime wedges and sliced onions.